When Company A is selected, the fields Person 1, 2, 3, and 4 should appear. 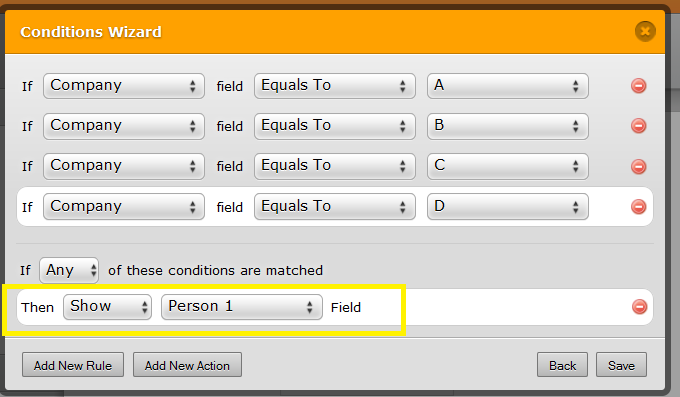 When Company B is selected, the fields Person 1 and 2 should appear. When nothing or Company C or D are selected, only field Person 1 should be visibile. Yet, for some reason Company A only allows Person 1, 3, and 4 to appear. Anyone know what to do to keep this from happening? Thanks! Works just like I want. Hi, I have assisted you over our chat support. And I feel responsible to give you the solution to your issue since I even recommended you to post here. Basically, in the actions rules, you should avoid using the same set of rules and fields. Just as Jeanette had describe. Hope this help. Feel free to inform us if you have further inquiry.